An acharya is a spiritual teacher who teaches not only by verbal instructions but by the way he acts in his own life. The Bhagavad-gita advises that anyone who wants spiritual knowledge should approach, serve, and sincerely inquire from a qualified acharya. An authentic acharya sees things as they are, and can reveal genuine knowledge to a sincere seeker. Vedic literature says that real success in life can be attained by approaching such an acharya. Qualified acharyas present the truth as received from their own spiritual teacher. An acharya should be spotless in character, and be a devotee of the Supreme Person. - why spiritual guides are necessary and how to find them. - more about why and how to seek and find qualified spiritual guides, with links to further reading. - an Indian student in the U.S.A. finds spiritual insight in the midst of Western "enlightened" materialism. 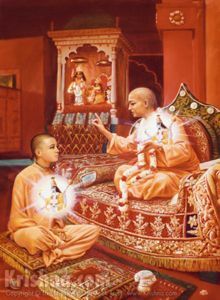 "In order to learn the transcendental science, one must approach the bona fide spiritual master in disciplic succession, who is fixed in the Absolute Truth"
"One who follows the disciplic succession of acharyas knows things as they are"
How to find a spiritual master since Srila Prabhupada's disappearance?